Oh summer, why do you have to end. I have really been enjoying these laid back days. I’ve been trying to take a long walk with the dog every morning and a swim with the kids in the evening followed by a dip in our hot tub before dinner. We’ve been able to finish up another home improvement project too, one I can’t wait to show you! If you follow me on Instagram you’ve already gotten a peek. I try to post on Instagram everyday. I’ll put the link at the end of this post if you’d like to follow me there. 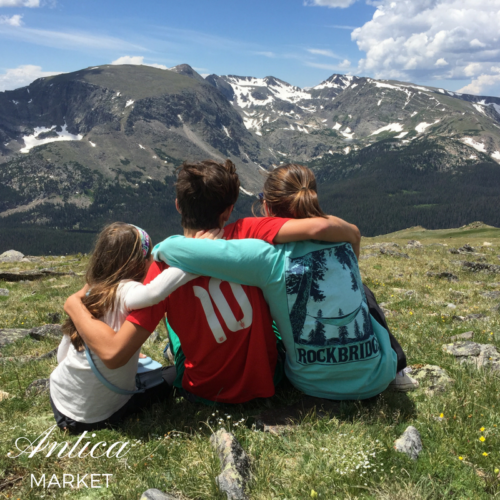 If you read my last post, I shared only part of the story of our family vacation to Rocky Mountain National Park. We had traveled there to attend a college friend’s daughter’s wedding. We chose to stay closer to the park than the wedding and found a VRBO place along the Great Thompson River in Estes Park. A couple days after the wedding our friends and some of their extended family drove up to Estes Park too and stayed at the YMCA of the Rockies. This is not your typical YMCA. In fact we all kind of wished we had made arrangements to stay there too. Surrounded by majestic mountains the campus has lots of family friendly activities and lodging options. 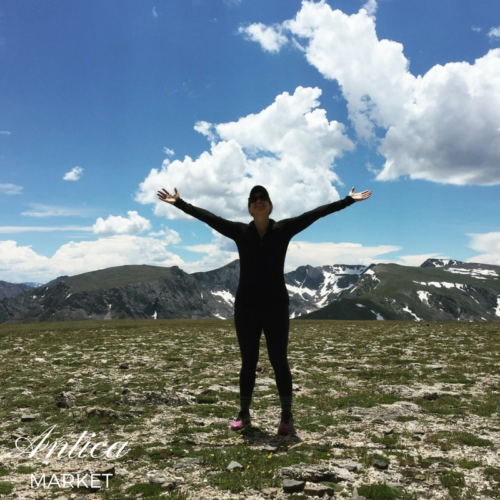 If you are heading to RMNP with kiddos I would definitely check it out! We played a round of mini-golf with the adults while all the teens and twenty-somethings were off playing frisbee golf together. 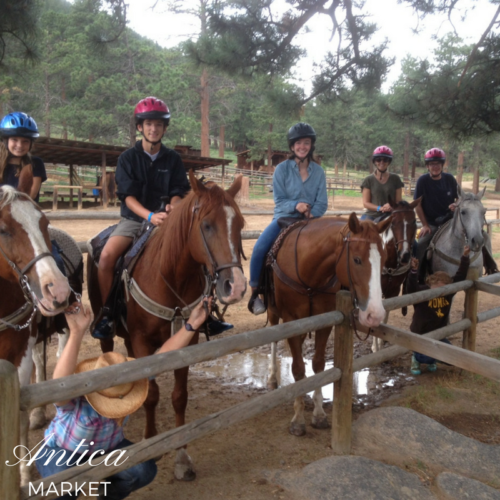 The YMCA also offers horseback riding which we decided would be a fun family memory. Two of our three kids had never been riding before and while I must admit I was a little worried about our 10 year old, she did just fine. One of the guides stayed by her side along the trail until she felt comfortable. After about an hour ride she was asking if we could buy her a horse. Yeah, that’s not going to happen, but a girl can dream. 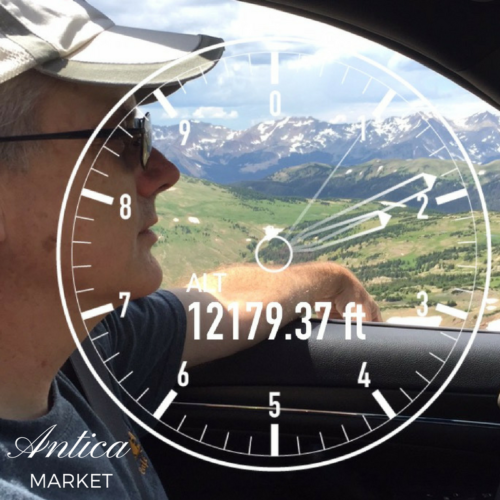 Following a park ranger’s advice we set out a day later to drive Trail Ridge Road up the mountain; a nationally designated All American Road. 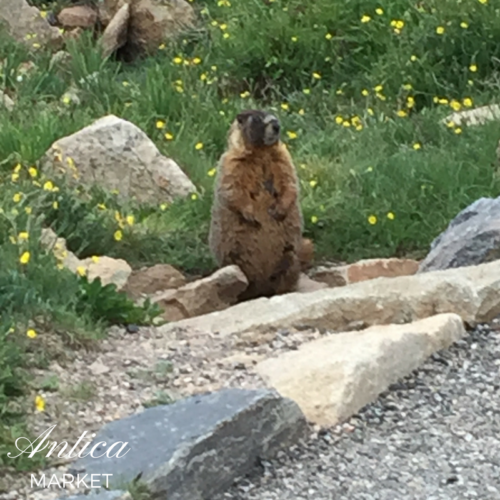 This is one of those things that you don’t want to miss out on when visiting RMNP. 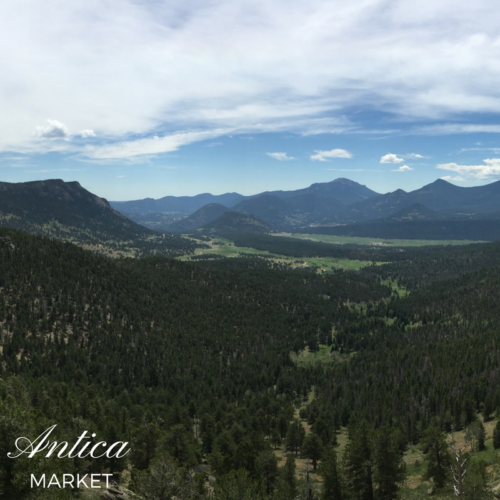 The road winds up the mountain from Estes Park to the alpine tundra, over the continental divide and down into Grand Lake. 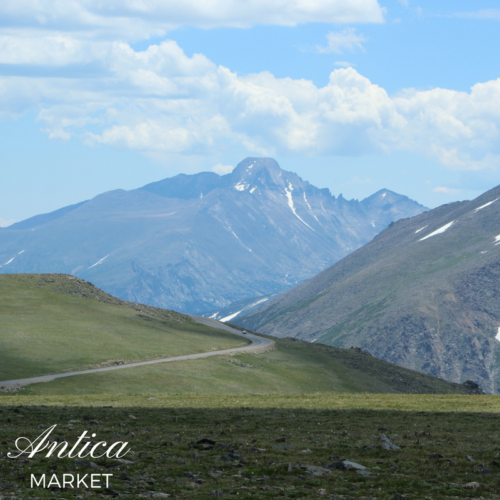 It reaches an altitude of 12,183 feet and the sweeping views of the Rockies are breathtaking! My husband looks pretty relaxed here, but there were some tense moments as it started to rain and there were no guard rails. We had been living off peanut butter sandwiches for lunch on our hikes, so we decided to stop at the Safeway in town before our drive and picked up some salami, cheeses, crackers and veggies for a little picnic lunch and we found the perfect spot in the tundra area. 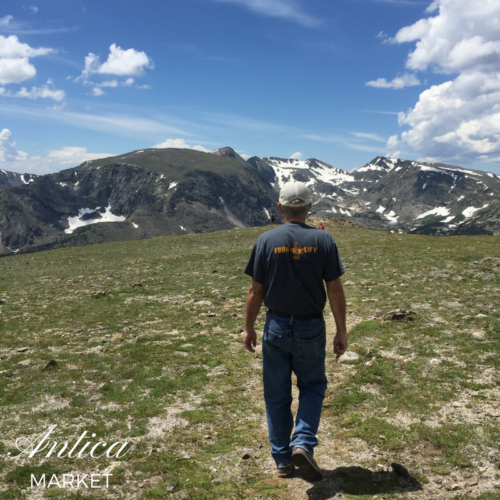 There are several places to pull off and some provide little walking paths, although at this altitude we couldn’t walk too far. The kids loved the novelty of finding a patch of snow. 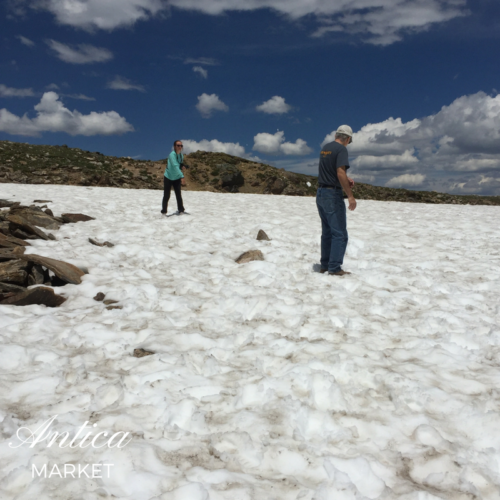 How many people get to have a snowball fight in summer? There is a visitor center at the top of the mountain with some educational information, a gift shop and cafe. My youngest earned a Junior Ranger Badge. 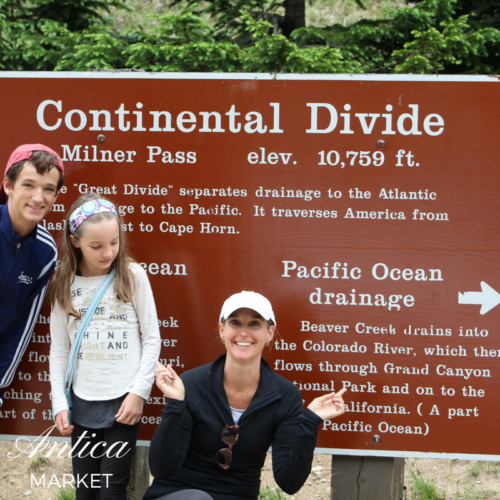 The kids thought it was cool when we got to the Continental Divide so we pulled over there as well. Ok, maybe I was the one who thought it was cool. We did spot some wildlife along the way too! Elk in abundance, marmots, and moose. We were a little disappointed that we didn’t spot any of the bighorn sheep though. 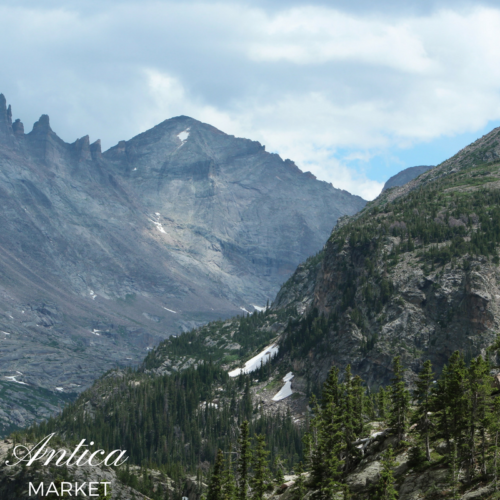 On the other side of the mountain sits the town of Grand Lake, the largest natural lake in Colorado. We were taken in by this charming waterfront town that had an air of the old west! 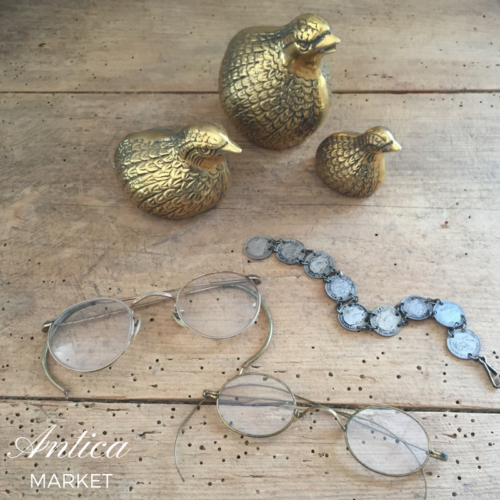 We did a little shopping where I found some vintage treasures. 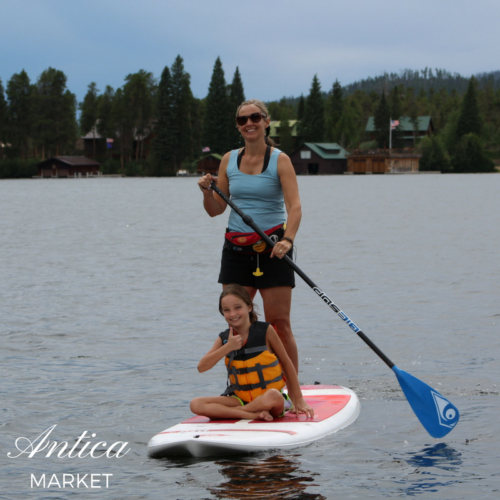 And since we were so enamored by the place, we came back a second day to try stand-up paddle boarding. For some reason my kids and I started paddling directly across the lake. The wind whipped up over the mountains and I got a little worried as I struggled to move back across the lake. I did finally get the hang of it and really enjoyed myself! I would definitely try it again. Earlier in the summer I read a book about the value of playing with your kids and family bonding. This trip certainly ticked that box! I’m so grateful for all the memories that we made on this family vacation, especially with my oldest heading off to college next week, and for the chance to take in the profound beauty in this world that is just waiting to be discovered. This looks like such an enjoyable vacation! 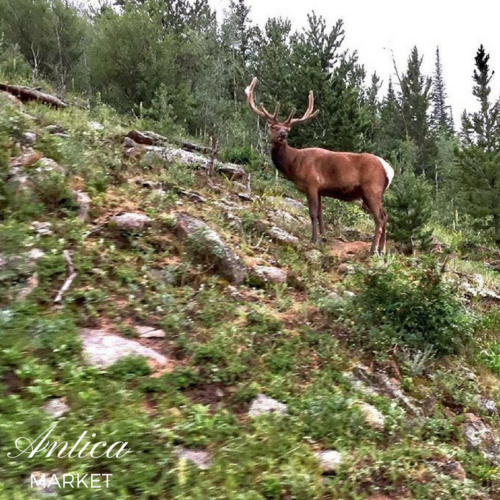 Rocky mountain national park is highly popular amongst the travelers coming from within the country and even from aboard due to the various activities in rocky mountain national park. Thank you so much for sharing this post. Keep going! Thank you a lot for providing individuals with remarkably splendid possiblity to read from here. It’s usually very good and as well , jam-packed with amusement for me personally and my office acquaintances to visit your web site really three times in one week to learn the fresh issues you will have. Not to mention, we are usually contented for the good secrets you give. Selected 4 areas in this post are surely the most beneficial we’ve ever had. I enjoy you because of all of the hard work on this web site. Debby delights in engaging in internet research and it’s really obvious why. Almost all hear all concerning the dynamic tactic you provide valuable things by means of the web blog and as well foster contribution from website visitors on that concern so my princess is in fact learning a great deal. Take pleasure in the remaining portion of the year. You are always carrying out a pretty cool job.